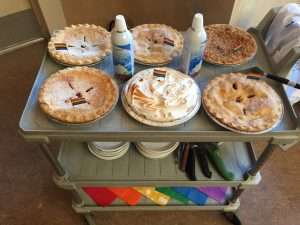 To celebrate National Affirming PIE Day (Pi Day…March 14) at Kamloops United Church the ‘Time for Learning’ during worship on March 17 included an explanation of the definitions for being PIE. Public, Intentional and Explicit. We heard about the importance of being PIE, of being loud, proud and clear about who is welcome at our table. As an example of a way to be PIE on a regular basis, the Affirming welcome that is repeated at the beginning of worship every Sunday at KUC was held up as an essential spiritual practice on our journey to Allyship. Following the service, the congregation was invited back into the sanctuary with their coffee to enjoy a piece of pie, and to watch the video created by AU/SE. It was a very happy Pi PIE pie day! Chris is ready with the pies. Bruce welcomes Chris to the pulpit. Pies and a cutie pie. We get ‘pie’ with a little help from our friends. Marg helps Ardie aim. Chuck P adds a little whipped cream. Enjoying pie, conversation and those who dressed for the occasion. Careful where you’re aiming that! Our Communion runner and in the background, creativity by Marnie. We get ‘pie’ with a little help from our friends. Chris sharing from the pulpit, our new Lenten banner and antependium and the beautiful rainbow communion runner. Dawne and Bev, all smiles. Cam and Marne being served by Barb. Variety! Of course! That is what it is about! Being Affirming is not a destination but a way of being. Cam acknowledges Barb and Chris, our servers. Thanks!